Get Coding! – I wrote a book. 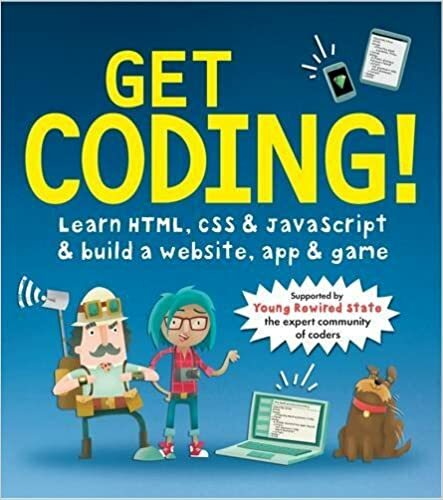 Through late 2015 and the start of 2016 I was working on a �secret project� that I could only allude to in conjunction with Walker Books UK and Young Rewired State � to write a book to get kids coding. As a hirer, I�ve seen first hand the difficulty in getting a diverse range of people through the door into technology roles, and I thoroughly believe that the best way we solve the problem is from the ground up – changing the way we teach computer science. We live in a world where the resources to teach programming are widely available if there�s an appetite for it, and the barrier to entry is lower than ever, so in some ways, this is my contribution to the movement. The book is available on Amazon and in major high street bookstores. I�ve been thrilled by the response from friends, family and the community, and it made the sometimes quite stressful endeavour thoroughly worthwhile. After launch, Get Coding! has ended up number 1 in a handful of Amazon categories, was in the top 2000 books on Amazon.co.uk for about a week, and has received a series of wonderfully positive reviews, not to mention being recently featured in The Guardians Best New Children’s Books Guide for Summer 2016. I�ll leave you with a few photos I�ve been sent or collected and hope that perhaps you�ll buy the book. Preparing a timeline for the development of software is a difficult problem � teams have proven time and time again that they�re tremendously bad at estimating how long it takes to develop software at any kind of scale. Unfortunately, there�s a conflict between the need for financial planning and budgeting, and the unpredictable nature of software delivery � to the extent that agile software advocate frequently dismisses the accuracy and need for timelines and schedules. This presents a difficult problem � organisations need to plan and budget, but their best technical people tell them that accurate planning is impossible. We can make projections to try and close this gap. Projections are common in financial planning and they serve the same purpose in software � they�re a forecast. Planning out and working on your company’s financial projections each year could be one of the most important things you do for your business. The results–the formal projections–are often less important than the process itself. If nothing else, strategic planning allows you to “come up for air” from the daily problems of running the company, take stock of where your company is, and establish a clear course to follow. Variances from projections provide early warning of problems. And when variances occur, the plan can provide a framework for determining the financial impact and the effects of various corrective actions. Projections are formal educated guesses � they don�t claim accuracy, but they intend to give a reasonable idea of progress. With a well thought out projection, your team can continuously evaluate how their current progress lines up with their projection. As and when the real teams� world progress and the projection start to diverge, they can realistically measure the difference between the two and adjust the projection accordingly. Used in this way, projections are a useful tool for communicating with business stakeholders � suggesting a �best guess at when we might be doing this work� and a means of communicating changes in timelines divorced and abstracted away from the �coal face� of user stories, velocity, estimation and planning. Teams use their projections and actual progress to explain and adjust for changes in complexity, scope and delivery time. If estimation and planning in software is hard, then projection is much harder � it�s �The Lord of the Rings� � a sprawling epic of fiction. On a small scale, planning is predicated on the understanding that �similar things, with a similar team, take a similar amount of time� � and this generally works quite well. People understand this quite intuitively � it�s the reason your plumber can tell you roughly how long it�ll take and how much it�ll cost to fit a bathroom. At a larger scale however, planning starts to fall apart. The more complex a job, the more nuance is involved and the more room to loose details and accuracy. The challenge in putting together a projection is to bridge the gap between the small scale accuracy of planning features, and the long term strategic objectives of a product. In order to put together a projection and make sure that it�s realistic, you need a base-line � some proven and known information to use as a basis of the projection. Agile teams generally use abstract estimation scales to plan work � frequently using the modified Fibonacci sequence or T-shirt sizes. It�s recommended to use a different scale than you would normally use for story estimation for your projections, to prevent people accidentally equating the estimates of stories in a sprint, to estimates on epics in a roadmap. I find it most useful to use Fibonacci for scoring user stories, and using t-shirt sizes for projections. This relative estimation technique is called stack ranking � it�s simplistic, but very easy for an entire team to understand. Take this first item, write it on a sticky note and position it somewhere in the middle of the wall, making a note of the time it took to complete the work as you stick it up. You should repeat this exercise with a handful of pieces of work that you�ve already completed � giving you a baseline of the kinds of tasks your team performs, and their relative complexity to each other based on their ordering. As you stick the notes on the wall, if something is significantly more difficult than something else, leave a bit of vertical space between the two notes as you place them on the wall. Now you�ve established a baseline around work that you�ve already completed, you can start talking � in broad terms, about the large stories or epics you want to projects and schedule. Work through your backlog of epics, splitting them down if you can into smaller chunks, and arranging them around the stack ranked work on your wall. If something is about as hard as something else, place it at the same level as the thing it�s as hard as. Once you�ve placed all of your backlog on the wall, arrange a time scale down the right hand side of the wall, based on the work you�ve already completed, and a scale from �XXXS� to �XXXL� on left hand side. The whole team can then adjust their estimates based on the time windows, and the relative sizes assembled on the wall. Once the team is happy with their relative estimates, they should assign a T-shirt size to each sticky note of work � which in turn, relates to a rough estimate of time. You can now remove the sticky notes from the wall, and arrange them horizontally into a timeline using the �medium size� sticky note as a guide. These timelines are based around a known set of completed work, but none the less, are just projections. They�re not delivery dates, they�re not release dates � they�re best guess estimates of the time window in which work will be completed. Projections are only successful when continually re-adjusted � they�re the early warning, a canary in the coal-mine, a way to know when you�re diverging from your expectations. Treating a projection like a schedule will cause nothing but unmet expectations and disappointment. As you complete actual pieces of work from your projection, you should verify its original projection against its actual time to completion � making note of the percentage of over or under estimation on that particular piece. Once you complete a piece, you should adjust your projection based on actual results � checking that your assertion that the �medium sized thing takes three months� holds true. Once armed with real information, you can have honest conversations about dates based in reality, not fiction, helping your product owners and stakeholders understand if they�re going to be delivering earlier or later than they expected, before it takes them by surprise. Visual Studio 2015 dropped today, along with C# 6, and a whole host of new language features. While many new features of .NET are tied to framework and library upgrades, language features are specifically tied to compiler upgrades, rather than runtime upgrades. What this means, is that so long as the build environment for your application supports C# 6, it can produce binaries that can run on earlier versions of the .NET framework, that make use of new language features. The good news for most developers is that this means that you can use these language features in your existing apps today � you don�t have to wait to roll out framework upgrades across your production servers. You�ll need to install the latest version of Visual Studio 2015 on your dev machines, and you�ll need to make sure your build server has the latest Build Tools 2015 pack installed to be able to compile code that uses C#6. I�ve verified C#6 apps, compiled under VS2015, at the very least run on machines that run .NET4.5. If you�re doing automated deployment with Kudu to Azure, you may need to wait until they roll out the tools pack to the Web Apps infrastructure. The page object model is a pattern used by UI automation testers to help keep their test code clean. The idea behind it is very simple – rather than directly using your test driver (Selenium / watin etc) you should encapsulate the calls to it’s API in objects that describe the pages you’re testing. Page objects gained popularity with people that felt the pain of maintaining a large suite of browser automation tests, and people that practice acceptance test driven development (ATDD) who write their browser automation tests before any of the code to satisfy them – markup included – exists at all. The common problem in both of these scenarios is that the markup of the pages changes, and the developer has to perform mass find/replaces to deal with the resulting changes. This problem only aggravates over time, with subsequent tests adding to the burden by re-using element selectors throughout the test codebase. In addition to the practical concern of modification, test automation code is natively verbose and often hides the meaning of the interactions its driving. Page objects offer some relief – by capturing selectors and browser automation calls behind methods on a page object, the behaviour is encapsulated and need only be changed in one place. Some page objects are anaemic, providing only the selector glue that the orchestrating driver code needs, while others are smarter, encapsulating selection, operations on the page, and navigation. The simplest page object is easy to home roll, being little more than a POCO / POJO that contains a bunch of strings representing selectors, and methods that the current instance of the automation driver gets passed to. Increasingly sophisticated page objects capture behaviour and will end up looking like small domain specific languages (DSLs) for the page being tested. This kind of page object can be used to help cleanup automation code where the navigation and selection code is external to the page object itself. Its a trivial sample to understand, and effectively serves as a kind of hardcoded configuration. This richer model captures the behaviour of the tests by internalising the navigation glue code that would be repeated across multiple tests. The final piece of the puzzle is the concept of Page Components – reusable chunks of page object that represent a site-wide construct – like a global navigation bar. Page components are functionally identical to page objects, with the single exception being that they represent a portion of the page so won’t have a Uri of their own. By using the idea of page objects, you can codify the application centric portions of your automation suite (selectors, interactions), away from the repetitive test orchestration. You’ll end up with cleaner and less repetitive tests, and tests that are more resilient to frequent modification. Page objects alone aren’t perfect – you still end up writing all the boilerplate driver code somewhere, but they’re a step in the right direction for your automation suite. We need to talk about configuration. The vast majority of software that you build and use needs to be configured � feature toggles, file and directory paths, startup options. We build configurable software every single day � especially if you build line of business apps. When we do this we somehow forget that all of the worst software experiences you have suffer from horrible installation and configuration processes. Ever had to set up a SharePoint cluster? Muddle through SQL Server replication configuration? Nobody ever had a good time configuring an application. Conversely, all the software that you love is defined by its slick user experience. Great software doesn�t require configuration, it just works. Every time I watch a developer add �just another configuration value� or �just add something extra into the installation script�, I feel a pang of sadness, because I know all that�s really happening is they�re setting themselves a trap for later. Configuration code takes time to build � you have to build parsers, or pick meaningful names for configuration settings. You have to plumb those settings into your code somewhere. For all this work? You�re rewarded with code that people can misconfigure. A new point of failure in your application. I�ve got some bad news for you. That documentation gets out of date, or that person that uses your code doesn�t even know exists. But lets pretend for a second, that this is all ok. Lets pretend we correctly configure our software for the environment it�s deployed into, with correct database connection strings, paths to dependent services, and weird internal settings for physical paths on the local machine. You start the application and it crashes. �Application failed to start due to DirectoryNotFoundException � couldn�t open c:\program files (x86)\YourApp\UserData�. You take a look, and sure enough, the directory doesn�t exist � so you create it and try again and the app starts. If you bought some software and endured that kind of user experience during installation and configuration, you�d probably give up, yet we don�t think twice about exposing our teams in dev and ops to this kind of complexity every single day. To make things worse, in my experience the vast majority of configuration in setup that applications go through isn�t even required � it�s just in place to cover the cracks where we could�ve done better as developers. Convention and inference are the antidotes to configuration and complexity in setup, and I want to spend a bit of time explaining how you can infer and discover the vast majority of behaviours and settings you think that you need to configure. We should aim for our software to be safe and configured by default. To understand why we implement configuration, we need to look at the kind of things that get configured. Environment specific configuration is frequently unavoidable, often repetitive and badly factored. Feature toggles and internal configuration are much more contentious, frequently defining functionality that shouldn�t be externally configured. If you�re building software and you need to deploy it to multiple target environments, you�re probably going to end up with some kind of application specific configuration, defining environmental settings, database connection strings, and URIs that you depend on. There�s a certain amount of necessity to environmental connection strings, but we can make it as simple as possible. Unfortunately, software that requires a lot of configuration and setup, is by definition more difficult to deploy, one of our key goals in building reliable, deployable software should be supporting simple automation. Simplicity in usage and installation is mandatory, not optional. Let�s talk about how we can make our software configuration simpler. Your application should attempt to verify the existence of absolutely everything it depends on, creating things as it needs to. This means that if you application requires certain data directories that don�t exist, or has expectations of other networked resources, it should detected, verify and create them at application startup. Failure detect dependencies it cannot create should be a fatal error, while the lack of a dependency it can create should result in those dependencies being correctly created. You application should refuse to startup in an invalid state, and ideally, should be able to create its entire execution environment from sensible defaults. Keeping these checks in the codebase of the application, and executing them at startup rapidly reduces time to resolution of any issues. It�s simple to implement, there is no excuse. Unpredictable environments have a cost on the complexity of application configuration. Do your best to ensure that all the target environments you deploy to follow regularly patterned names, and verify these strong conventions. This regularity in your environment makes mistakes trivial to spot, and reduces the need for verbose and error prone configuration. Irregularly formed environments require a huge amount of configuration to automate, and that configuration will be brittle and get broken. Anything that a human has to configure, a computer can probably do better. Consider having your software detect the environment it exists in, and configure itself appropriately. You can lean on environmental variables, or even by detecting which services exist in the environment at startup either by connecting to them, or using a service registry of some kind. This is an obvious technique to use if you have configuration for failover services � at runtime, your application can attempt to connect to both the primary and secondary service, and select which one to configure itself against. I�ve had good experiences using this technique to load balance across payment gateways that had a tendency to fail. One of the absolute worst things I see regularly, is huge configuration files, and templated transformations, to repeatedly change a single portion of a templated string over and over. and allow the application to splice the two strings together. This means that your environmental configuration files replace a single line of configuration � not 50. We can take this further and support overridden settings from environmental variables, all because the application now controls how it�s configured and doesn�t blindly read a text file and just go with it. I�ve seen this remove literally hundreds of lines of configuration peppered through lengthy transformation files. Never repeat yourself in a configuration file. Devise a general way to override any of your inferred or conventional configuration settings. There will always be the odd environment or special circumstance that requires configuration, so you should make a point of it being the exception rather than the rule. We�ve talked about how regulating deployment environments allows you to configure your software by convention, how predictability makes this easy and divergence makes it hard. We�ve discussed how allowing your application to verify and create it�s local dependencies relieves the administrator from doing this mundane tasks. We�ve also considered how detection heuristics can help you remove any notion of environmental configuration from your code, instead focusing on the services the app can discover when it starts up. And finally, we�ve looked at how trivial configuration templating can remove much of the friction and duplication from the small amounts of required configuration. It�s really easy to �just add more configuration� in situations where discovery heuristics and self-configuring applications are the correct answer, but configuring software is a user experience problem. You�d not accept it from boxed software you bought, so you should do your best to protect your teams from configuration, and the accidental bugs that occur when they get it wrong.